The Record’s Ticking was born in late 2013. Everything you see on the site is hand made by myself, Rob Hume. It started really as just a hobby, making a few clocks for my mates and family for birthdays and Christmas. It just grew from there. The records I use are all either un-playable or terrible records. As the records I use are either unwanted, damaged and unplayable, instead of them being thrown away, I’m giving them a new life and in a small way I’m are doing my bit to help the environment. Each lamp & clock made is a functional piece of art, made using traditional craft methods. 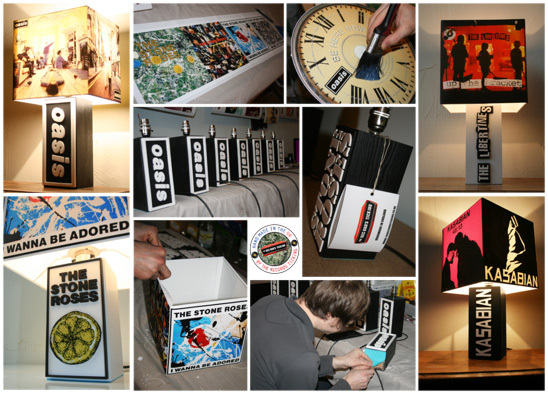 Generally I tend to stick to making things related to what I’m into, but I’m happy to do custom designs (See the ‘Create Your Own Clock page’) Feel free to message me with ideas, and if its one I can re-sell I will do it at the standard price for you.